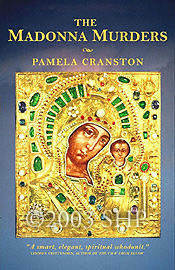 "Fast-paced, fascinating, and fun...Pamela Cranston enlivens a murder mystery with iconography, musings about good and evil, Russian History, wit and compelling characters. A smart, elegant, spiritual whodunit." —Lindsey Crittenden, author of The Water Will Hold You: A Skeptic Learns to Pray (Harmony Books, 2007) and also The View From Below, 1997 winner of the Mid-List Press First Series Award in Short Fiction. The Madonna Murders features both the Icon of Kazan and the Crystal Skull. The Crystal Skull was "found" in real life by the English explorer Frederick Mitchell-Hedges who simultaneously owned the Icon of Kazan. This is the same Crystal Skull featured in the Steven Spielberg movie: Indiana Jones and the Kingdom of the Crystal Skull (requires Flash player). Want to write your own review of The Madonna Murders? Drop us a line! © 2003. Please do not use or reprint without permission from St. Huberts Press except for brief quotes in book reviews. Copies of such reviews must be sent to the publisher. The Madonna Murders: Chapter 1. This excerpt is in PDF format and requires Adobe Reader to be installed. Visit Adobe's site to download Reader if it is not already installed. 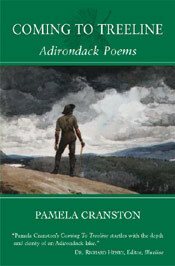 These extraordinary poems celebrate the High Peaks Region of the Adirondacks in upstate New York. Pamela Cranston vividly connects the reader to the mountains, lakes, streams and people who have been part of her life for over fifty years. "I have been in most of the places where these poems are set. Pamela Cranston has captured them with grace and invested them with another skin of meaning and of beauty." Want to write your own review of Coming To Treeline: Adirondack Poems? Drop us a line! © 2005. Please do not use or reprint without permission from St. Huberts Press except for brief quotes in book reviews. Copies of such reviews must be sent to the publisher. These excerpts are in PDF format and require Adobe Reader to be installed. Visit Adobe's site to download Reader if it is not already installed.